Download "Compensation Claim Decision Under section 3702 of title 31, United States Code"
5 OPM File Number of her having been in substantially continuous employment and having an intact transportation agreement. 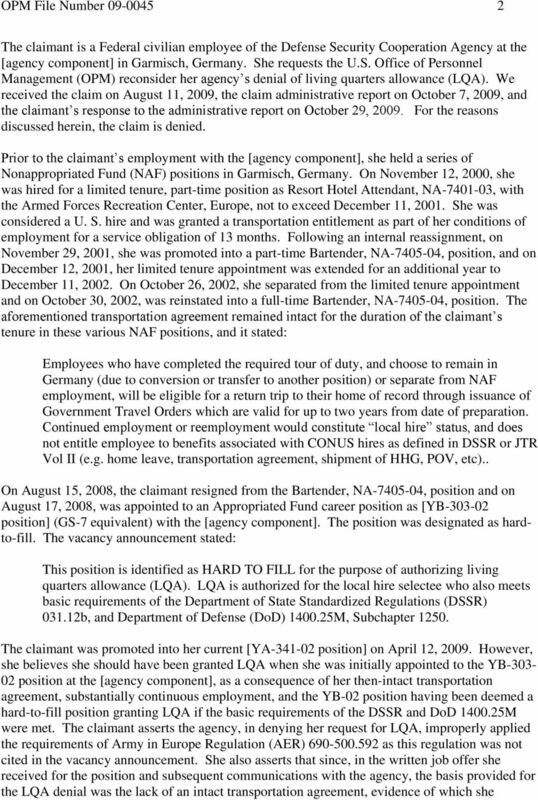 AER , Civilian Personnel Living Quarters Allowance, 18 November 2005, prescribes policy for authorizing LQA to appropriated fund civilian employees of the U.S. Army in Europe, and as such imposes additional requirements beyond the basic eligibility criteria of the DSSR. It states that LQA will be granted for the following employees: (3) Federal civilian or NAF employees selected for or converted from NAF to positions in grades GS-09 (or equivalent), WG-11, WL-05, and above; or a position that has an equivalent target grade; a hard-to-fill position; or a career program position at any grade; who meet all of the following: (a) Are transferring to the European theater from another overseas Government activity or agency without a break in service. (b) Meet basic eligibility criteria in DSSR, section or a and b. (c) Were already receiving or eligible to receive LQA at the time of selection. 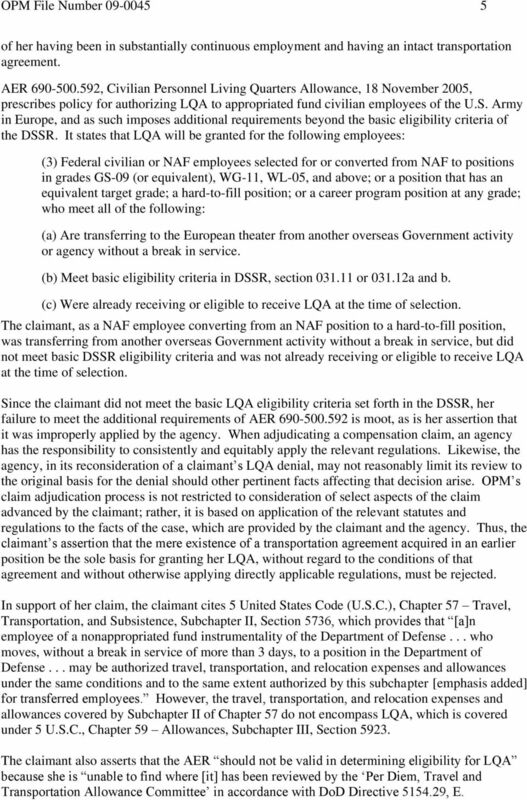 The claimant, as a NAF employee converting from an NAF position to a hard-to-fill position, was transferring from another overseas Government activity without a break in service, but did not meet basic DSSR eligibility criteria and was not already receiving or eligible to receive LQA at the time of selection. Since the claimant did not meet the basic LQA eligibility criteria set forth in the DSSR, her failure to meet the additional requirements of AER is moot, as is her assertion that it was improperly applied by the agency. When adjudicating a compensation claim, an agency has the responsibility to consistently and equitably apply the relevant regulations. Likewise, the agency, in its reconsideration of a claimant s LQA denial, may not reasonably limit its review to the original basis for the denial should other pertinent facts affecting that decision arise. OPM s claim adjudication process is not restricted to consideration of select aspects of the claim advanced by the claimant; rather, it is based on application of the relevant statutes and regulations to the facts of the case, which are provided by the claimant and the agency. Thus, the claimant s assertion that the mere existence of a transportation agreement acquired in an earlier position be the sole basis for granting her LQA, without regard to the conditions of that agreement and without otherwise applying directly applicable regulations, must be rejected. In support of her claim, the claimant cites 5 United States Code (U.S.C. ), Chapter 57 Travel, Transportation, and Subsistence, Subchapter II, Section 5736, which provides that [a]n employee of a nonappropriated fund instrumentality of the Department of Defense... who moves, without a break in service of more than 3 days, to a position in the Department of Defense... may be authorized travel, transportation, and relocation expenses and allowances under the same conditions and to the same extent authorized by this subchapter [emphasis added] for transferred employees. 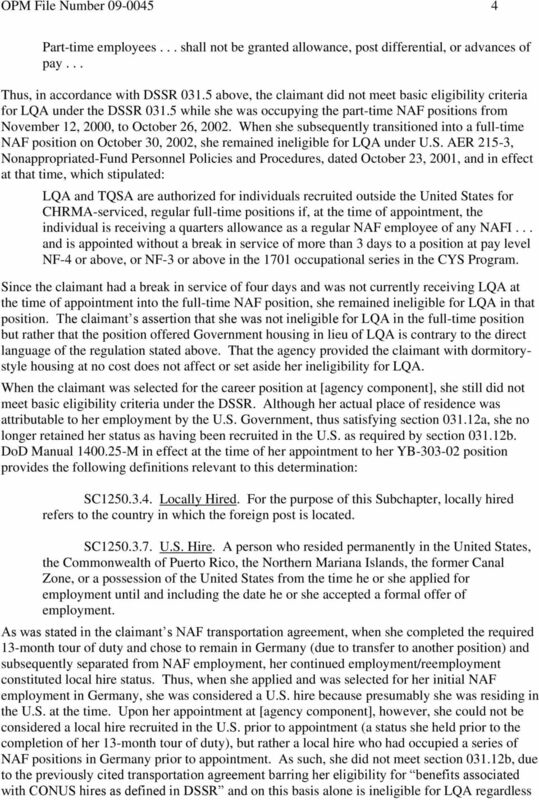 However, the travel, transportation, and relocation expenses and allowances covered by Subchapter II of Chapter 57 do not encompass LQA, which is covered under 5 U.S.C., Chapter 59 Allowances, Subchapter III, Section The claimant also asserts that the AER should not be valid in determining eligibility for LQA because she is unable to find where [it] has been reviewed by the Per Diem, Travel and Transportation Allowance Committee in accordance with DoD Directive , E.
6 OPM File Number Procedures 1.d. 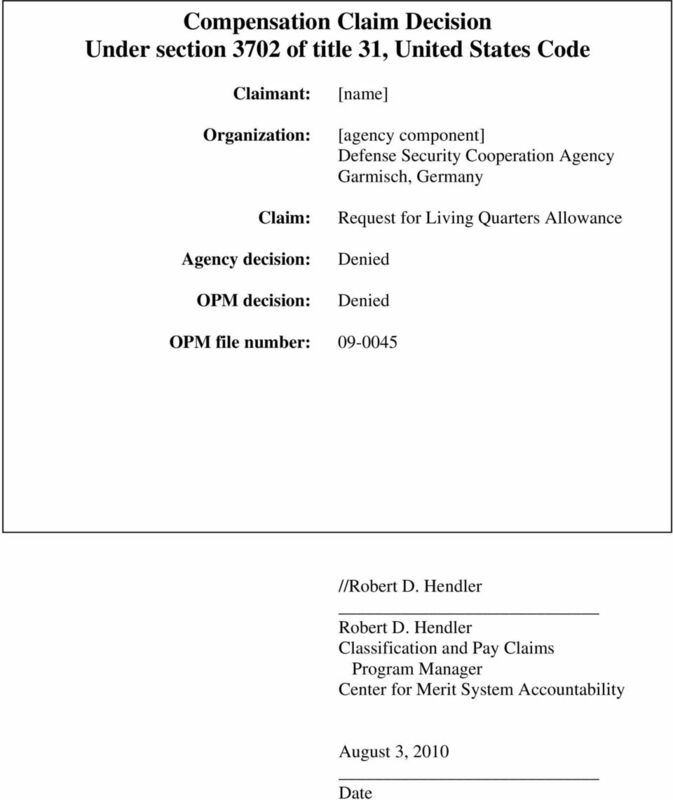 However, as stated previously, LQA is not governed by Subchapter II of Chapter 57 and, thus, does not fall under the provisions of DoD Directive OPM s claims adjudication authority under 31 U.S.C is narrow and does not extend to determining or commenting on agency regulation approval propriety. 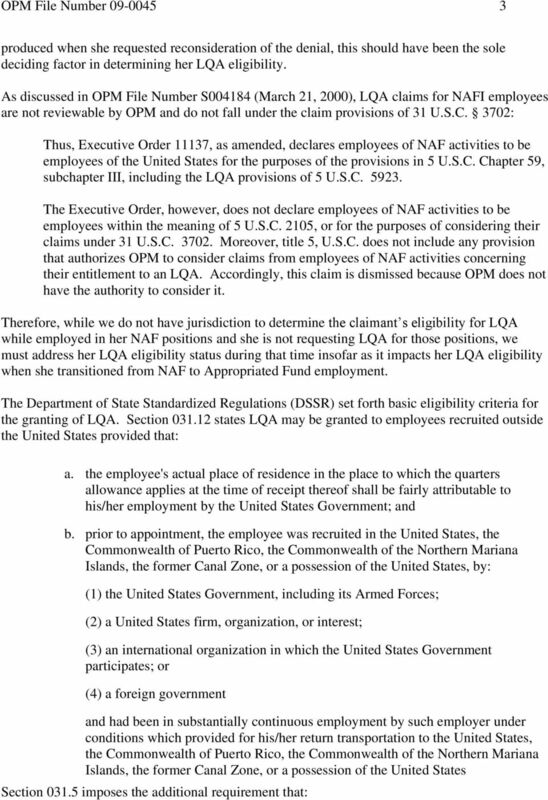 DoD Manual M specifies overseas allowances are not automatic salary supplements, nor are they entitlements. They are specifically intended as recruitment incentives for U.S. citizen civilian employees living in the United States to accept Federal employment in a foreign area. If a person is already living in the foreign area, that inducement is normally unnecessary. The statutory and regulatory languages are permissive and give agency heads considerable discretion in determining whether to grant LQA to agency employees Wesley L. Goecker, 58 Comp. Gen. 738 (1979). Thus, an agency may withhold LQA payments from an employee when it finds the circumstances justify such action, and the agency s action will not be questioned unless it is determined the agency s action was arbitrary, capricious, or unreasonable. Joseph P. Carrigan, 60 Comp. Gen. 243, 247 (1981); Wesley l. Goecker, 58 Comp. Gen. 378 (1979); OPM Decision S (1997). In this case, the claimant was a local hire who was neither already receiving nor eligible for LQA at the time of selection. The agency s action is not arbitrary, capricious, or unreasonable. Accordingly, the claim for an LQA is denied. The claimant introduced the issues of emergency leave, renewal agreement travel (RAT), and home leave in her response to the claim administrative report. Section (a) of title 5, Code of Federal Regulations (CFR), which implements section 3702(b) of title 31, United States Code, requires claims against the Government be written and signed. Sections (a) and (b) of 5 CFR also indicate the claimant s employing agency already has reviewed and issued a written decision on a claim before it is submitted to OPM for adjudication. There is no indication the claimant has filed a written, signed claim with her employing agency regarding these issues and received a final agency-level decision from a duly authorized official. 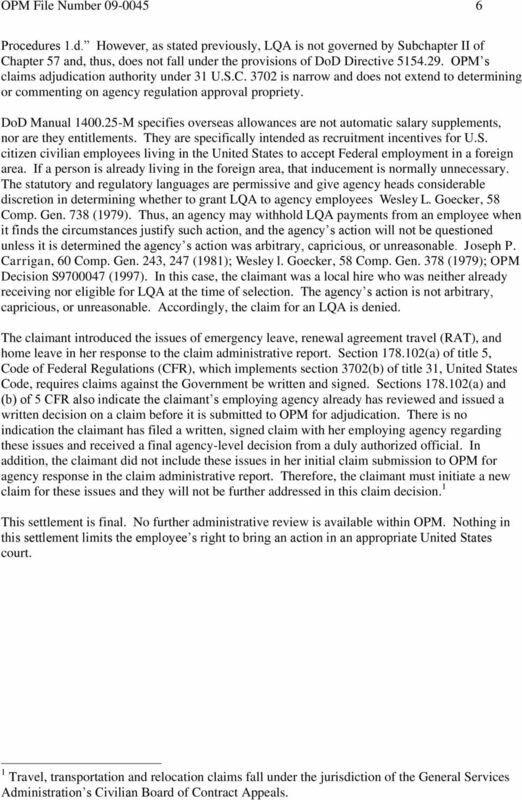 In addition, the claimant did not include these issues in her initial claim submission to OPM for agency response in the claim administrative report. Therefore, the claimant must initiate a new claim for these issues and they will not be further addressed in this claim decision. 1 This settlement is final. No further administrative review is available within OPM. Nothing in this settlement limits the employee s right to bring an action in an appropriate United States court. 1 Travel, transportation and relocation claims fall under the jurisdiction of the General Services Administration s Civilian Board of Contract Appeals. 2. SCOPE: This directive applies to employment of civilian annuitants who would be subject to salary offset under 5 U.S.C. 8344 or 5 U.S.C. 8468. ORS 107.135 Vacation or modification of judgment; policy regarding settlement; enforcement of settlement terms; remedies. parties that all employees covered by this Agreement will find it necessary to work additional time either at such premises or away from such premises to fulfill the full scope of their professional responsibility.